Yet another way to use up over-ripe bananas.. I know I have many recipes along these lines but I never tire of them. Or more honestly, I rarely turn back to them, always on the hunt for more. This time, I also had some greek yogurt that needed using up, and I was in the mood for some nice spice. Mash the bananas with the yogurt, and stir in the vanilla. Beat the eggs and sugar until very fluffy. Add the banana yogurt, then the baking soda, baking powder, flour and spices. Stir together until combined. 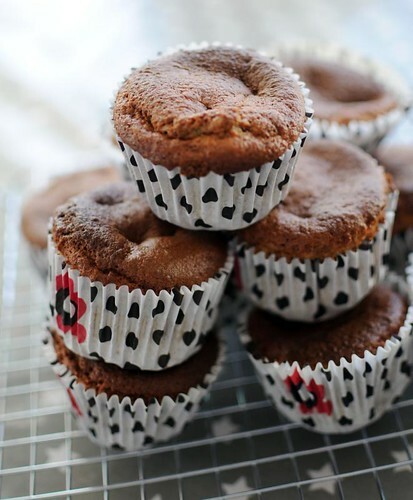 Divide into 12 lined muffin cups, and bake at 175°C for about 15 minutes.